You may run into a situation where you need to re-assign a tour to another customer. This can easily be accomplished within the Tourbuzz system. Follow along below to see the steps to move a tour from one customer to another. *If the customer has an existing account within your customer list, skip to step 2. Create an account for the new customer by going to customers > edit > create new customer. Go tour your list of tours. You can access this page by clicking on the tours link under the Tourbuzz logo. Once on that page, click edit next to the tour you'd like to make these changes on. 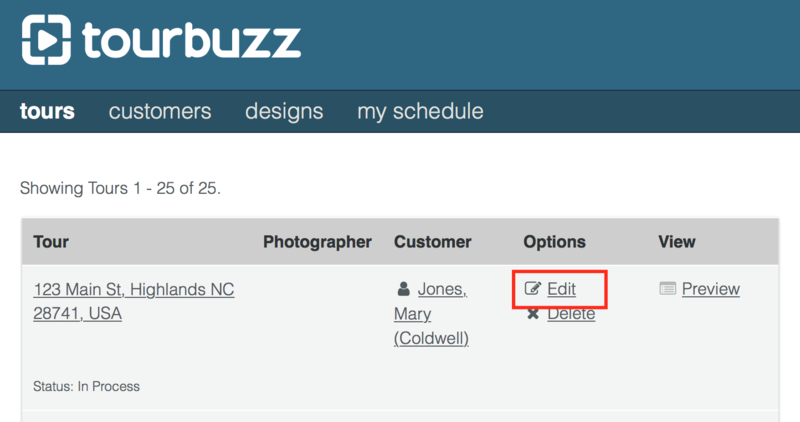 Highlight and delete the full customer name from the "Customer" field. **Do not click "edit customer." Clicking this will bring you to that specific customer's record and any changes made cannot be reversed. Start typing in the new customer name. An auto-fill box will drop down and complete the rest of the customer's name. Click save. You have successfully moved a tour from one customer to another! Will my tour links change when I move a tour to a new customer? No, your tour links will remain the same. However, you'll need to re-send the tour announcement email to provide an updated Download Center link. Can I change the customer even after the tour has been published? Yes, you can make any changes to the tour at any time - even after the tour has been published.